Old Arizona meets New Arizona. A Grizzled Arizona Old Timer just happened to be in the right place at the right time today at the middle-of-nowhere Arrowhead Bar & Grill where the Procession took a surprise pit stop half way into their Journey Home to Prescott. Apparently, Procession officials picked the most out-of-the-way place for a pit stop to minimize the possibility of gawking onlookers and extraneous picture takers. 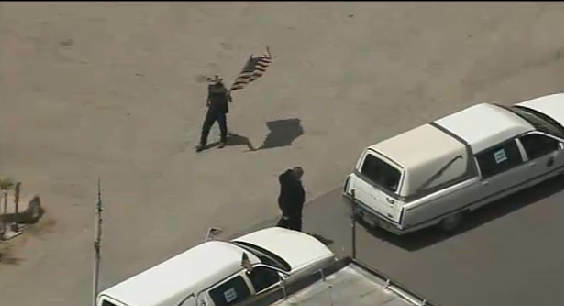 It just so happened that this Old Timer just happened to have an American Flag on a staff and the Procession essentially descended upon him in the parking lot. He had been out beside US Highway 89 expecting the Procession to pass him by. We watched as the helicopter camera following his gimpy, limpy gait alongside the line of parked hearses as he paid his respects to each one in turn.. As far we we could tell, no one spoke to him and he didn't speak to anyone, either. It was a very powerful vignette for us to watch and we are grateful to be able to have captured this screen shot. Whoever you are, THANKS, Cowboy! Watching the Procession live today has been one of the most emotional experiences of my entire life. It spanned nearly 5 hours and put me though the wildest roller coaster of emotions. My tears glands are worn out and running on empty. My Heart has been wrung out repeatedly today like a Yavapai County Cow Camp dish rag. When the Procession first pulled out of the Maricopa County Coroner's Office, I didn't think I could watch another second. I had to leave the computer. Gradually I came back, peeking at the Procession, a little longer each time. When they turned off I-17 to head to Wickenburg, the outpouring of support there had me sobbing uncontrollably. Arizona really came together to Honor The Arizona 19. I am so proud of Arizona today. I have no words. As the procession headed up toward Yarnell Hill, I realized what was happening was a cathartic thing. We were all collectively experiencing a statewide mourning ceremony. We were mourning together...whether we were standing beside the road or watching people stand beside the road didn't matter. We were all in this one together, totally united, totally One Heart. In my 34 years in Arizona, I've never experienced anything like this before. As the procession wound its way through that impossibly twisted highway between Yarnell and Prescott, "The Long and Winding Road" by The Beatles played in my head, as did many other tunes. By the time the Procession reached Prescott, I could feel an uplifting of my Heart and Spirit. Instead of being depressed and downcast as I have been during the past week, I began to feel restored and reconnected. In my mind what happened here has been an Arizona Wake conducted Arizona Style so that each and every one of us could confront the meaning of this Arizona tragedy in both our own terms and together with our Fellow Arizonans. You see, today we were ALL Arizonans! No matter where our Home is located, each of us lived today as an Arizonan. Today's Honoring of The Arizona 19 represents to me a Shining Diamond in Crown Jewels of Arizona's Illustrious History. Today, Arizona rose above and beyond and lifted The Fallen Fire Fighters To The Stars and the Heavens Beyond for The Blessings they so Truly Deserve. I have never been prouder of my State of Arizona than today. God Bless each and every one of you who made this wonderful moving Memorial possible. You have all made history. You have all brought respect not only to The Arizona 19 but to the Legacy, Tradition and Honor of The Great State of Arizona.